Named after the frenzy and hype created by Def Leppard's drummer Rick Allen car accident on the New Year's eve of 1984,Hysteria is Def Leppard's most successful album to date. Selling more than 25.5 million copies,the album was supposed to be a full rock version emulating Michael Jackson's Thriller as told by Hysteria's Producer Robert Lange. It took more than 4 years for the album to be released with tragedy striking Def Leppard band members before and after the release of Hysteria on August 3rd 1987. Back in the holiday season of 1984 when Def Leppard made an announcement on their new album Hysteria, drummer Rick Allen's left arm was ripped apart from his body as he crashed his car on a wall built on a dangerous curve in Sheffield city, England. Hysteria would be guitarist Steve Clark's last album as he drank himself to death, as the band reached dizzy heights following Hysteria's incredible success. "Women" the lead track for Hysteria, "Rocket" and "Animal" failed miserably at the charts becoming the least popular as well as the least sold of all Hysteria tracks. "Pour Some Sugar On Me" whose lyrics were written in a hurry and recorded in a jiffy with a low budget music video would eventually become The most successful single from the album. Selling more than 10 million copies, "Pour Some Sugar On Me " is considered best song ever by many critics, online magazines and music television networks including MTV and VH1. The song was a last minute addition to an already finalized Hysteria album, the title chosen by the band's lead singer Joe Elliott during a casual conversation with producer Robert Lange. One Sunday afternoon Elliott asked for some sugar cubes for his tea from producer Robert Lange who asked if one or two sugar cubes, to which Elliott responded by saying "Just pour some sugar on me". "Pour Some Sugar On Me " sold 4 million copies in the United States , a million more than in the U.K... just like Def Leppard's 1983 album Pyromania which was a phenomenal hit in the U.S, selling 100,000 copies a week with sell out concerts but never picked up in the U.K with near empty concerts. "Hysteria" drummer Rick Allen's brainchild,is one of the very few love ballads included in the album,keeping with their tradition of having just one or two love ballads for every album they release. After drummer Rick Allen's car accident, Steve Clark's worsening alcoholism and a massive four year gap...many critics had written their farewell message to Def Leppard. The odds of Rick Allen playing drums again was one in a zillion, but the miracle did happen..unlike most of us who would have been sucked in depression, Rick Allen decided to fight instead of being resigned to his fate, he started practicing his unique customized MIDI drums by his left foot in less than 20 days of his car accident. By the end of 1985 Rick has mastered his MIDI drums and the miracle was beginning to take shape. It took $5 million for the miracle album Hysteria to take shape leaving the band indebted to the tune of 800,000 pounds to their record label Phonogram. In a highly indebted stage without any of the first three tracks "Women", "Rocket" and "Animal" gaining traction,Def Leppard was just beginning to be bothered before "Love Bites" calmed them a bit. 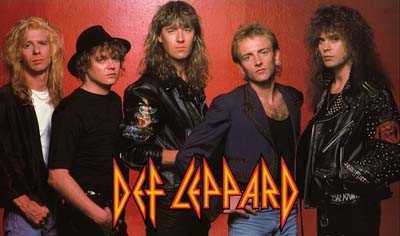 "Pour Some Sugar On Me " took them from rags to riches becoming Def Leppard's first no.1 single from Hysteria to top the U.S Billboard Hot 100 singles chart while "Armegeddon It", "Gods Of War","Don't Shoot Shotgun" and "Run Riot" made them drunk and "Hysteria" etched their names in the history books forever.